While a grilled steak can be pretty good I’m not happy unless there’s a sauce. 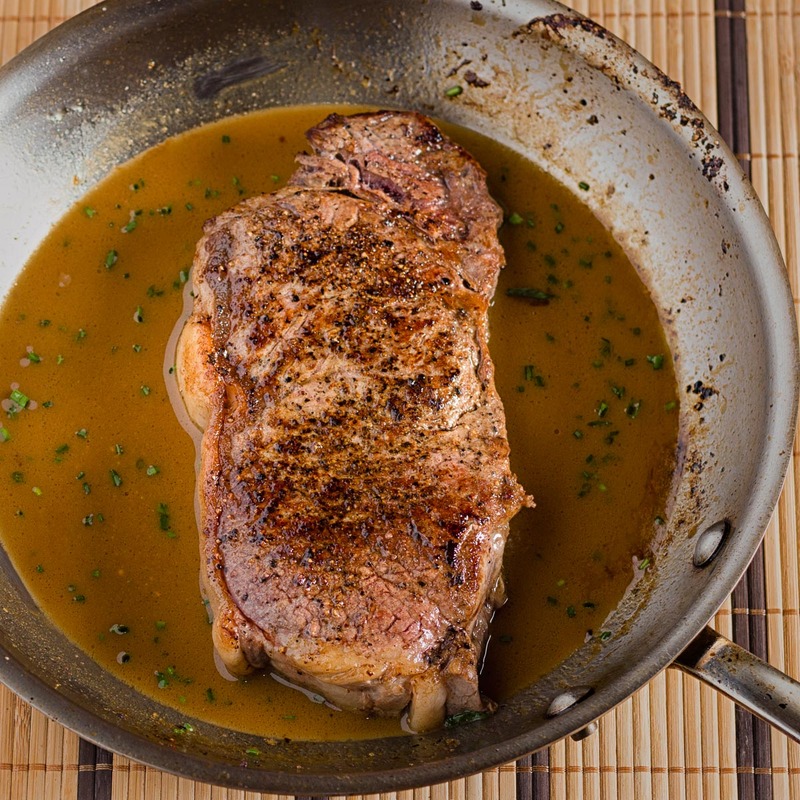 For me, a pan fried steak is where it’s at. A splash of wine, a bit of stock – in this case veal stock – and a couple of flavour highlights and you move into serious territory. This is all about the veal stock. Talk to your butcher. Get into the habit of freezing it to have it at hand. 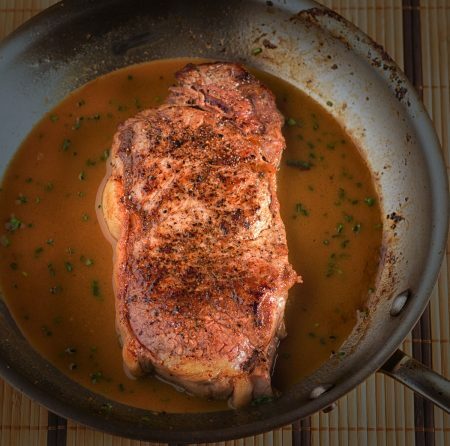 Veal stock is about a million times better than beef stock. Maybe 100 million times. It’s the difference between McDonald’s and the best french restaurant in town. 20 minutes start to finish and you've just made something better than they serve in 95 percent of restaurants. Pre-heat your oven to 375F. Heat an oven proof skillet over medium heat. Season the steaks with salt and pepper. Add1 Tbsp butter and 1 Tbsp olive oil to the pan until the butter stops sizzling. Watch out - you don't want the butter to burn. Add the steaks and pan fry for about 90 seconds per side then place in pre-heated oven for about 3-4 minutes for rare to medium rare. I can't predict this for you. Steaks are different thicknesses. Use your instant read thermometer to be certain - 125F is the magic number for beef. Remove pan from oven, put a cloth on the handle to remind you it's screaming hot, and remove steaks. Place pan over medium heat. Add white wine, scraping up any browned bits and reduce to a syrupy glaze. This is called deglazing. Add veal stock or demi-glace and simmer briefly. Whisk in the mustard. Off heat, whisk in the remaining 2 Tbsp butter one tablespoon at a time. Taste sauce and adjust seasoning if necessary. In beef, french, main course, meat. Bookmark the permalink. Just tried this recipe with a couple of rib steaks last night. Very easy to make and extremely yummy!!! !